DA Form 4881-6 or the "Request And Approval For Loan Or Lease Of Equipment And Loan Or Lease Agreement" is a Department of the Army-issued form used by and within the United States Military. The form - often incorrectly referred to as the DD form 4881-6 - was last revised on July 1, 2004. 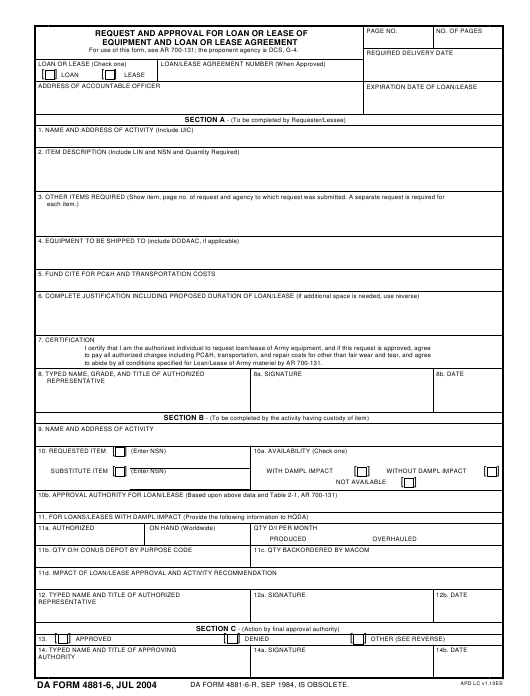 Download an up-to-date fillable DA Form 4881-6 down below in PDF-format or look it up on the Army Publishing Directorate website. For use of this form, see AR 700-131; the proponent agency is DCS, G-4. to abide by all conditions specified for Loan/Lease of Army materiel by AR 700-131. DA FORM 4881-6-R, SEP 1984, IS OBSOLETE.